"Calling the Shots! offers teachers practical ways to raise standards of children’s writing within a thoughtful, forward-looking curriculum." 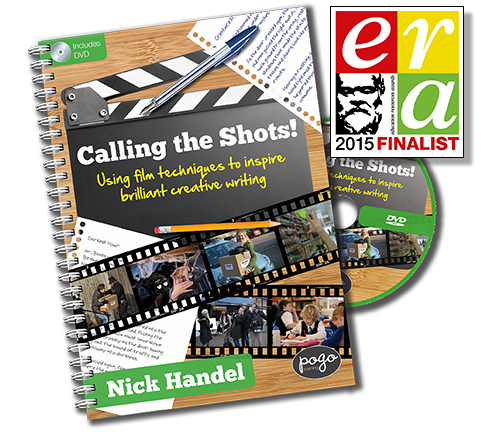 "...a useful, quirky, creative corker of a resource." "...this is cineliteracy at its best and is a must-have for primary schools looking for a fresh approach to creative writing..."
"...a fantastic, easy to use resource. A must have." Calling the Shots! helps children understand how film and TV use a variety of techniques to create stories. It then guides them through the process of using these same techniques in their creative writing. Written by a former BBC producer and featuring a number of familiar faces, the resource contains full teaching notes, original, professionally-shot films and a range of supporting material. Calling the Shots! is matched to the revised National Curriculum and includes grammar focus sections throughout, to ensure that both technical and creative skills are developed. "What an absolute gem of a teaching resource!" "At last, a way of using the children’s interest in TV positively. Calling the Shots! offers a rich, fun, interesting and innovative educational experience. It’s great to offer pupils a modern and fresh look at developing their writing." "It is quite simply unique and fantastic. The idea of using film to inspire children and enhance their creative writing is innovative and appealing to both boys and girls alike." Children are used to watching high-quality TV and movies and we don't think the resources they use in school should be any different. So, Calling the Shots! features professional actors and actresses, including Sarah Hadland (better known as Stevie from Miranda), was filmed by professional film crews and we even had original music composed. So, you can be sure that your class will get a great experience. Nick Handel is a former BBC producer who has had a very successful TV career. He discovered the dog that could say 'sausages' on That's Life!, made countless acclaimed documentaries and produced several Children in Need Appeals. He now uses the skills he's learned in TV to help children improve their writing. Ready to get your class excited about writing? We accept payment by debit/credit card or PayPal. "The impact on children’s writing will undoubtedly be beneficial. Film works so well as a scaffold for ideas, sequence and plot and it appeals to all abilities. The way this resource leads children through the directorial role will help them develop their writer’s voice, their inner auteur, whilst teachers will appreciate its utility." "Supports good practice in engaging a range of learners and provides opportunities for whole text study, talk, drama, grammar level and extended writing – aspects which all enable children to access and enjoy producing high quality creative writing, as well as solving the problem so commonly experienced by teachers of 'I don’t know what to write'"